Enjoy 2 hours driving south to My Tho on old high way 1A then enjoy a morning bicycle ride to explore on some small islands, visiting local communities and farming land. In the afternoon, you will have a leisurely cycle ride to countryside around Cai Be on your way to homestay. Have breakfast with your host and leave for Tra Vinh city today. The cycling of today allows you to meet and mingle with local on bike alongside Mekong River to Cho Lanh. Then continue cycling on paved paths to Cai Mon town which very well-know with nursery garden, ornamental plants and bonsai trees. Have lunch at local's. 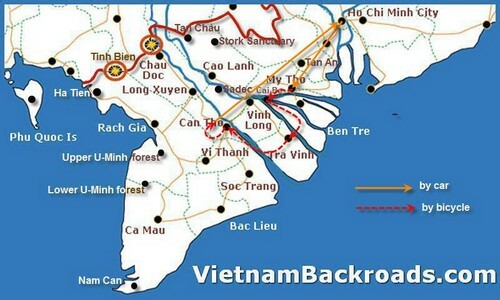 After lunch, continue to enjoy your riding on unique routes to Tra Vinh via Ben Tre. In morning, we cycle on smooth paths to Khmer communities in countryside of Tra Vinh. There are so many things that can not be missed and so many interesting of farming activities need to be seen in the homeland of Khmer over here in Mekong Delta. In the afternoon, we will wander through fruit gardens to Tra On and cross the branch of lower river to Can Tho. My girlfriend and I were fortunate enough to take a 3-night, 4 day tour of the Mekong Delta with Vietnam Backroads and had an amazing time. From our first initial enquiry to the moment we were dropped back at our hotel, we were dealt with promptly and professionally. During our trip we cycled from village to village along the Mekong Delta, getting a taste of local provincial life, eating great food and meeting some amazing people along the way. During this trip we experienced a number of different sides of this region, such the fruit growing areas (stopping off to meet the farmers while they worked and sample their goods), the scenic rice fields of the Khmer people and finally the canal districts. Our guide Thang, was an absolute machine, taking care of all meals, providing cycling coaching when needed and by simply making things happen (including when a usual river taxi was unavailable, he arranged for a local coconut farmer into taking us across the river in his stocked coconut boat – which was pretty unique experience). Thang was full of information and always keen to educate us on the Vietnamese way of life and give us every opportunity to experience it – a genuinely great guy and a pleasure to spend our time with. I can’t recommend Vietnam Backroads highly enough – for my girlfriend and I this was a very different and unique way to see Vietnam, and experience its culture from the very heart of it. We had an amazing time! Thanks Ms. Hue & Thang for an incredible experience. Shaun Hutcheson. December 9, 2013. Thang is the best guide- very patient, knowledgeable and awesome. The bikes & routes are great. We've learned so many things about Vietnam. We've also done so many firsts ( boat rides , our bikes, eating rice mice, etc). Such an amazing tour. We'll definitely recommend it to friends. We had a wonderful time. December 4th, 2013. If you have a sense of adventure than I would not hesitate to combine interests of sight-seeing with cycling on and off roads. The trip was made more memorable by the knowledgeable guide and friendships formed along the way. I would recommend the tours highly and plan to do another before I head back home. Thanks, goes out to Anh Thang, Anh Van, and Michael guys. I wanted to send a note to tell you how much we enjoyed our Mekong Bike Tour. It exceeded our expectations! Our guide, Thang, was excellent. He really made us feel like we were a local. His knowledge and love for Vietnam is apparent, and he shared so much information with us. This was more than a bike trip, it was a cultural trip though the Mekong Delta that happened to be on bikes. Thang quickly found out that we love food and he made sure we tried everything. We have never had such good food on a trip! Thang also arranged stops along the way to learn about Temples, coconut farming, brick making, rice paper production, coconut palm leaf roofs, water hyacinth weaving and so much more. Our driver, Mr. Thao, was also very good. He was prompt and helpful. Ms Katie: I have enjoyed every minute and have been very impressed with all the staff. From when i booked, I always had very quick responses to my emails. Our guide, Nghi was very knowledgeable and did everything. He could make our stay as enjoyable as possible. Thanks you very much! Our driver was excellent too!